Shāh Abbās the Great or Shāh Abbās I of Persia (Persian: شاه عباس بزرگ‎; 27 January 1571 – 19 January 1629) was the 5th Safavid Shah (king) of Iran, and is generally considered the strongest ruler of the Safavid dynasty. He was the third son of Shah Mohammad Khodabanda. Although Abbas would preside over the apex of Iran's military, political and economic power, he came to the throne during a troubled time for the Safavid Empire. Under his weak-willed father, the country was riven with discord between the different factions of the Qizilbash army, who killed Abbas' mother and elder brother. Meanwhile, Iran's enemies, the Ottoman Empire (its archrival) and the Uzbeks, exploited this political chaos to seize territory for themselves. In 1588, one of the Qizilbash leaders, Murshid Qoli Khan, overthrew Shah Mohammed in a coup and placed the 16-year-old Abbas on the throne. But Abbas was no puppet and soon seized power for himself. Under his leadership, Abbas created numerous opportunities for thousands of Circassians, Georgians, and Armenians to join the civil administration and the military. With the help of these newly created layers in Iranian society (initiated by his predecessors but significantly expanded during his rule), Abbas managed to completely crush and diminish the power of the Qizilbash in the civil administration, the royal house and the military. These actions, as well as his reforms of the Iranian army, enabled him to fight the Ottomans and Uzbeks and reconquer Iran's lost provinces. By the end of the 1603-1618 Ottoman War, Abbas had regained possession over Transcaucasia and Dagestan, as well as swaths of Eastern Anatolia and Mesopotamia; the latter two were territories which had been lost as a result of the 1555 Peace of Amasya. He also took back land from the Portuguese and the Mughals and expanded Iranian rule and influence in the North Caucasus, beyond the traditional territories of Dagestan. Abbas was a great builder and moved his kingdom's capital from Qazvin to Isfahan, making the city the pinnacle of Safavid architecture. In his later years, following a court intrigue involving several leading Circassians, Abbas became suspicious of his own sons and had them killed or blinded. 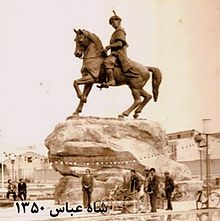 Abbas was born in Herat (now in Afghanistan, then one of the two chief cities of Khorasan) as the third son of the royal prince Mohammad Khodabanda and his wife Khayr al-Nisa Begum (known as "Mahd-i Ulya"), the daughter of the Marashi ruler of the Mazandaran province, who claimed descent from the fourth Shi'a Imam Zayn al-Abidin. At the time of his birth, Abbas' grandfather Shah Tahmasp I was the Shah of Iran. Abbas' parents gave him to be nursed by Khani Khan Khanum, the mother of the governor of Herat, Ali-Qoli Khan Shamlu. [nb 1] When Abbas was four, Tahmasp sent Abbas' father to stay in Shiraz where the climate was better for his fragile health. Tradition dictated that at least one prince of the royal blood had to reside in Khorasan, so Tahmasp appointed Abbas as the nominal governor of the province, despite his young age, and Abbas was left behind in Herat. In 1578, Abbas' father became Shah of Iran. Abbas' mother soon came to dominate the government, but she had little time for Abbas, preferring to promote the interests of his elder brother Hamza. The queen consort antagonised leaders of the powerful Qizilbash army, who plotted against her and murdered her on 26 July 1579, reportedly for having an affair with Adil Giray, brother of the Crimean Tatar khan who was held captive in Qazvin. Mohammad was a weak sovereign, incapable of preventing Iran's main rivals, the Ottoman Empire, but also the Uzbeks, from invading the country or stopping factional feuding among the Qizilbash. The young prince, Hamza, was more promising and led a campaign against the Ottomans, but he was murdered suspiciously in 1586. Attention now turned to Abbas. At the age of 14, Abbas had come under the guardianship of Murshid Qoli Khan, one of the Qizilbash leaders in Khorasan. When a large Uzbek army invaded Khorasan in 1587, Murshid decided the time was right to overthrow Shah Mohammad. He rode to the Safavid capital Qazvin with the young prince and pronounced him king on 16 October 1587. Mohammad made no objection against his deposition and handed the royal insignia over to his son during the following year on 1 October 1588. [nb 2] Abbas was 17 years old. Copper engraving by Dominicus Custos, from his Atrium heroicum Caesarum pub. 1600–1602. The kingdom Abbas inherited was in a desperate state. The Ottomans had seized vast territories in the west and the north-west (including the major city of Tabriz) and the Uzbeks had overrun half of Khorasan in the north-east. Iran itself was riven by fighting between the various factions of the Qizilbash, who had mocked royal authority by killing the queen in 1579 and the grand vizier Mirza Salman Jabiri in 1583. First, Abbas settled his score with his mother's killers, executing three of the ringleaders of the plot and exiling four others. His next task was to free himself from the power of Murshid Qoli Khan. Murshid made Abbas marry Hamza's widow and a Safavid cousin, and began distributing important government posts among his own friends, gradually confining Abbas to the palace. Meanwhile, the Uzbeks continued their conquest of Khorasan. When Abbas heard they were besieging his old friend Ali Qoli Khan Shamlu in Herat, he pleaded with Murshid to take action. Fearing a rival, Murshid did nothing until the news came that Herat had fallen and the Uzbeks had slaughtered the entire population. Only then did he set out on campaign to Khorasan. But Abbas planned to avenge the death of Ali Qoli Khan and he arranged for four Qizilbash leaders to kill Murshid after a banquet on 23 July 1589. With Murshid gone, Abbas could now rule Iran in his own right. Abbas decided he must re-establish order within Iran before he took on the foreign invaders. 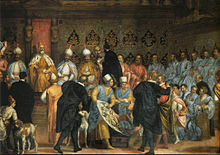 To this end he made a humiliating peace treaty – known as the Treaty of Istanbul – with the Ottomans in 1589/90, ceding them the provinces of Azerbaijan, Karabagh, Ganja, Dagestan, and Qarajadagh, as well as parts of Georgia, Luristan and Kurdistan. This demeaning treaty even ceded the previous capital of Tabriz to the Ottomans. The Qizilbash had provided the backbone of the Safavid army from the very beginning of Safavid rule and they also occupied many posts in the government. As a result, effective power in the state in the early days of the dynasty was held by the Qizilbash, leaving the shah often powerless. To counterbalance their power and as a decisive answer to this problem, Abbas turned to the newly introduced members of Iranian society (an initiative put in place by Shah Tahmasp I) the ghulams (a word literally meaning "slaves"). From these newly introduced slaves, the Shah created a gunpowder force, reaching numbers up to 37,000 soldiers, completely funded by the Crown. This weakened the power that the Qizilbash had against the crown significantly as they no longer had a "military monopoly" in Persia. Like the janissaries of the neighbouring Ottoman Empire, these ghulams were mainly Georgians, Circassians and Armenians who had been brought into Iran en masse (by conquest and slave trade), had converted or had been converted to Islam, and had taken up service in the army, royal household or the civil administration, and were loyal only to the shah. Under Abbas' leadership this new grouping in Iranian society (also called the third force) grew in influence and power, with many thousands of ethnic Georgians, Circassians and Armenians becoming an integral part of Iranian society and taking up key government, royal household and military positions. Tahmasp I, the second Safavid shah, had realised, by looking at his own empire and that of the neighbouring Ottomans, that he faced ongoing threats from dangerous rival factions and internal family rivalries that were a threat to him as the head of state. If not properly managed, these rivalries represented a serious threat to the ruler or could lead to unnecessary court intrigues. For Tahmasp, the problem revolved around the military tribal elite of the empire, the Qezelbāš, who believed that physical proximity to and control of a member of the immediate Safavid family guaranteed spiritual advantages, political fortune and material advancement. Therefore, between 1540 and 1555, Tahmasp conducted a series of invasions of the Caucasus region which provided battle experience for his soldiers, as well as leading to the capture of large numbers of Christian Circassian and Georgian slaves (30,000 just in these four raids). These slaves would form the basis of an Safavid military slave system. These slaves would serve a similar role in their formation, implementation and use to the janissaries of the neighbouring Ottoman Empire. Their arrival in such large numbers led to the formation of a new grouping in Iranian society solely composed of ethnic Caucasians. Although the first slave soldiers would not be organized until Abbas' reign, during Tahmasp's time Caucasians would already become important members of the royal household, the harem and in the civil and military administration. Learning from his grandfather, Abbas (who had been used by the vying Qizilbash factions during his youth) decided to encourage this new (Caucasian) grouping in Iranian society, as he realized that he must impose his authority on the Qezelbāš or remain their tool. Under Abbas, he single-handedly encouraged the growth in influence and power of this new grouping, also called the third force. It is estimated that during Abbas' reign alone some 130,000 to 200,000 Georgians, tens of thousands of Circassians, and around 300,000 Armenians were deported from the Caucasus to Persia's heartland, with a significant number gaining responsibilities and roles in Iranian society, including some of the highest positions of the state, including the ghulam corps. Many of those deported from the Caucasus settled in various regions of Iran and became craftsmen, farmers, cattle breeders, traders, soldiers, generals, governors and peasants within Iranian society. As part of the ghulam slave system, Abbas greatly expanded the ghulam military corps (also known as ḡolāmān-e ḵāṣṣa-ye-e šarifa, tr. as "crown servants") from just a few hundred during Tahmasp's era, to 15,000 highly trained cavalrymen, as part of a whole army division of 40,000 Caucasian ghulams. Abbas then reduced the number of Qizilbash provincial governorships and systematically moved Qizilbash governors to other districts, thus disrupting their ties with the local community and reducing their power. Most were eventually replaced by ghulams, whose loyalty was to the shah. By 1595, Allahverdi Khan, a Georgian, had become one of the most powerful men in the Safavid state  when he was appointed the Governor-General of Fars, one of the richest provinces in Persia. His power reached its peak in 1598, when he became the commander-in-chief of all the armed forces. Not only did the ghulam system allowed the shah to control and manage the rival Qizilbash Turks and Persians, it also resolved budgetary problems, in the short term at least, as by restoring the Shah's complete control of the provinces formerly governed by the Qizilbash chiefs, the provinces' revenues now supplemented the royal treasury. From now on, government officials collected the taxes and remitted them directly to the royal treasury. In the harem, the Circassians and Georgians rapidly replaced the Turcoman factions and, as a result, gained a significant direct influence on the meritocratic Safavid bureaucracy and the court of the Safavid state. 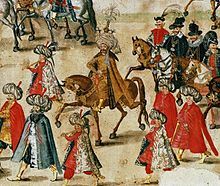 The increasing numbers of Georgians and Circassians in the Safavid bureaucracy and the court of the Safavid state vied with the Qizilbash for power and as a result also became involved in court intrigues. This competition for influence saw queens (and their supporters in the harem, court and bureaucracy) compete against each other in order to get their own sons on the throne. This competition increased under Abbas and his successors which weakened the dynasty considerably. Abbas' own son and crown prince, Mohammad Baqer Mirza, was caught in the court intrigue involving several leading Circassians, which would eventually cost him his life. Though the ghulam system did not work as well as it had after the Safavids, the third force would continue to play a crucial role during the rest of the Safavid era and later until the fall of the Qajar dynasty. Abbas needed ten years to get his army into shape so that he could effectively confront his Ottoman and Uzbek enemies. During this period, the Uzbeks and the Ottomans took swaths of territory from Iran. He also used military reorganisation as another way of side-lining the Qizilbash. He created a standing army of many thousands of ghulams (always conscripted from ethnic Georgians and Circassians), and to a much lesser extent Iranians, to fight alongside the traditional, feudal force provided by the Qizilbash. The new army regiments' loyalty was to the Shah. The new army consisted of 10,000 to 15,000 cavalry or squires (conscripted Caucasian ghulams) armed with muskets and other weapons (then the largest cavalry in the world), a corps of musketeers, or tufangchiyan, (12,000 strong) and a corp of artillery, called tupchiyan (also 12,000 strong). In addition Abbas had a personal bodyguard, composed of Caucasian ghulams, that was increased to 3,000. This force amounted to about 40,000 soldiers paid for and beholden to the Shah. Abbas greatly increased the number of cannon at his disposal so that he could field 500 cannon in a single battle. Ruthless discipline was enforced and looting was severely punished. Abbas was also able to draw on military advice from a number of European envoys, particularly the English adventurers Sir Anthony Shirley and his brother Robert Shirley, who arrived in 1598 as envoys from the Earl of Essex on an unofficial mission to persuade Persia to enter into an anti-Ottoman alliance. From 1600 onwards, the Safavid statesman Allāhverdī Khan, in conjunction with Robert Shirley, undertook further reorganizations of the army, which led to a further increase in the number of ghulams to 25,000. During the 1590s, Abbas moved to depose the provincial rulers of Persia. He started with Khan Ahmad Khan, the ruler of Gilan, who had disobeyed Abbas' orders when he asked that his daughter to marry Abbas' son Safi Mirza. This resulted in a Safavid invasion of Gilan in 1591 under the leadership of one of Abbas' favourites, Farhad Khan Qaramanlu. In 1593–94, Jahangir III, the Paduspanid ruler of Nur, travelled to the court of the Abbas, where he handed over his domains to him, and spend the rest of his life on an estate at Saveh, which Abbas had given to him. In 1597, Abbas deposed the Khorshidi ruler of Lar. One year later, Jahangir IV, the Paduspanid ruler of Kojur, killed two prominent Safavid nobles during a festival in Qazvin. In response, in 1598 Abbas invaded his domains and besieged Kojur. Jahangir managed to flee, but was captured and killed by a pro-Safavid Paduspanid named Hasan Lavasani. Abbas' first campaign with his reformed army was against the Uzbeks who had seized Khorasan and were ravaging the province. In April 1598 he went on the attack. One of the two main cities of the province, Mashhad, was easily recaptured but the Uzbek leader Din Mohammed Khan was safely behind the walls of the other chief city, Herat. Abbas managed to lure the Uzbek army out of the town by feigning a retreat. A bloody battle ensued on 9 August 1598, in the course of which the Uzbek khan was wounded and his troops retreated (the khan was murdered by his own men during the retreat). However, during the battle, Farhad Khan had fled after being wounded and was later accused of fleeing due to cowardice. He was nevertheless forgiven by Abbas, who wanted to appoint him as the governor of Herat, which Farhad Khan refused. According to Oruch Beg, Farhad Khan's refusal made Abbas feel that he had been insulted. Due to Farhad Khan's arrogant behaviour and his suspected treason, he was seen as a threat to Abbas, so Abbas had him executed. Abbas then converted Gilan and Mazandaran into the crown domain (khasseh), and appointed Allahverdi Khan as the new commander-in-chief of the Safavid army. By 1599, Abbas had conquered not only Herat and Mashhad, but had moved as far east as Balkh. This would be a short-lived victory and he would eventually have to settle on controlling only some of this conquest after the new ruler of the Khanate of Khiva, Baqi Muhammad Khan attempted to retake Balkh and Abbas found his troops were still no match for the Uzbeks. By 1603, the battle lines had stabilized, albeit with the loss of the majority of the Persian artillery. Abbas was able to hold onto most of Khorassan, including Herat, Sabzevar, Farah, and Nisa. Abbas' north-east frontier was now safe for the time being and he could turn his attention to the Ottomans in the west. After defeating the Uzbeks, he moved his capital from Qazvin to Isfahan. "Abbas King of Persia", as seen by Thomas Herbert in 1627. The Safavids had not yet beaten their archrival, the Ottomans, in battle. After a particularly arrogant series of demands from the Ottoman ambassador, the Shah had him seized, had his beard shaved and sent it to his master, the sultan, in Constantinople. This was effectively a declaration of war. In the resulting conflict, Abbas first recaptured Nahavand and destroyed the fortress in the city, which the Ottomans had planned to use as an advance base for attacks on Iran. The next year, Abbas pretended he was setting off on a hunting expedition to Mazandaran with his men. This was merely a ruse to deceive the Ottoman spies in his court – his real target was Azerbaijan. He changed course for Qazvin where he assembled a large army and set off to retake Tabriz, which had been in Ottoman hands for some time. 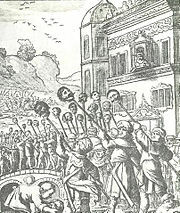 Drawing of the capture of Tabriz and the parading before Shah Abbas I of the severed heads of Ottoman soldiers. Drawn by a European traveller, 1603. For the first time, the Iranians made great use of their artillery and the town – which had been ruined by Ottoman occupation – soon fell. Abbas set off to besiege Yerevan, a town that had become one of the main Ottoman strongholds in the Caucasus since the Safavids had ceded it in 1590. It finally fell in June 1604 and with it the Ottomans lost the support of most Armenians, Georgians and other Caucasians. But Abbas was unsure how the new sultan, Ahmed I, would respond and withdrew from the region using scorched earth tactics. For a year, neither side made a move, but in 1605, Abbas sent his general Allahverdi Khan to meet Ottoman forces on the shores of Lake Van. On 6 November 1605 the Iranians, led by Abbas, scored a decisive victory over the Ottomans at Sufiyan, near Tabriz. In the Caucasus, during the war Abbas also managed to capture what is now Kabardino-Balkaria. The Persian victory was recognised in the Treaty of Nasuh Pasha in 1612, effectively granting them back suzerainty over most of the Caucasus. Several years of peace followed as the Ottomans carefully planned their response. But their secret training manoeuvres were observed by Iranian spies. Abbas learnt that the Ottoman plan was to invade Iran via Azerbaijan, take Tabriz then move on to Ardabil and Qazvin, which they could use as bargaining chips in exchange for other territories. The shah decided to lay a trap. He would allow the Ottomans to enter the country, then destroy them. He had Tabriz evacuated of its inhabitants while he waited at Ardabil with his army. In 1618, an Ottoman army of 100,000 led by the grand vizier, invaded and easily seized Tabriz. The vizier sent an ambassador to the shah demanding he make peace and return the lands taken since 1602. Abbas refused and pretended he was ready to set fire to Ardabil and retreat further inland rather than face the Ottoman army. When the Turkish vizier heard the news, he decided to march on Ardabil right away. This was just what Abbas wanted. His army of 40,000 was hiding at a crossroads on the way and they ambushed the Ottoman army in a battle, which ended in complete victory for the Iranians. In 1623, Abbas decided to take back Mesopotamia, which had been lost by his grandfather Tahmasp through the Ottoman-Safavid War (1532-1555). Profiting from the confusion surrounding the accession of the new Ottoman sultan Murad IV, he pretended to be making a pilgrimage to the Shi'ite shrines of Kerbala and Najaf, but used his army to seize Baghdad. 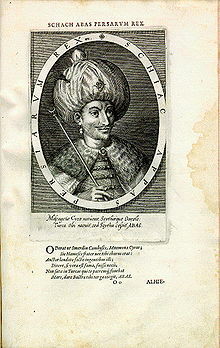 However, Abbas was then distracted by a rebellion in Georgia in 1624 led by Giorgi Saakadze thus allowing an Ottoman force to besiege Baghdad, but the Shah came to its relief the next year and crushed the Turkish army decisively. In 1638, however, after Abbas' death, the Ottomans retook Baghdad and the Iranian–Ottoman border was finalised to be roughly the same as the current Iran - Turkey and Iran - Iraq borders. Teimuraz I of Kakheti (also known as Tahmuras Khan). 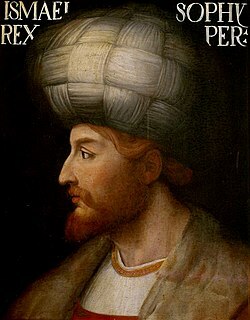 Between 1614 and 1616, during the Ottoman-Safavid War, Abbas suppressed a rebellion led by his formerly loyal Georgian subjects Luarsab II and Teimuraz I (also known as Tahmuras Khan) in the Kingdom of Kakheti. In 1613, Abbas had appointed these trusted Georgian gholams on the puppet thrones of Kartli and Kakheti, the Iranian Safavid ruled areas of Georgia. Later that year, when the shah summoned them to join him on a hunting expedition in Mazandaran, they did not appear as they feared that they would be either imprisoned or killed. Ultimately forming an alliance, the two sought refuge with the Ottoman forces in Ottoman ruled Imereti. This defection of two of the Shah's most trusted subjects and gholams infuriated Abbas, as reported by the Safavid court historian Iskander Beg Munshi. The following spring of 1614, Abbas I appointed a grandson of Alexander II of Imereti to the throne of Kartli, Jesse of Kakheti (also known as "Isā Khān"). Raised up at the court in Isfahan and a Muslim, he was fully loyal to the Shah. Subsequently, the Shah marched on Kutaisi, the capital of Imereti, and punished its peoples for harbouring the defectors. He returned to Kartli, and in two punitive campaigns he devastated Tblisi, killed 60–70,000 Kakheti Georgian peasants, and deported between 130,000-200,000 Georgian captives to Iran. After having fully secured the region, he executed the rebellious Luarsab II of Kartli and later had the Georgian queen Ketevan, who had been sent to the Shah as a negotiator, tortured to death when she refused to renounce Christianity, in an act of revenge for the recalcitrance of Teimuraz. Kakheti lost two-thirds of its population in these years as a result of Abbas' punitive campaign either through deportation to Iran or to a lesser extent being killed. 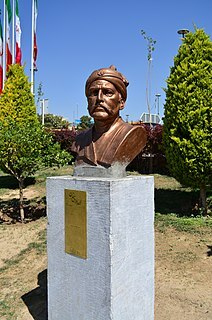 Teimuraz did return to eastern Georgia in 1615 where he defeated a Safavid force. However this was just a brief setback for Abbas as he made plans so that such a revolt could not happen again. Abbas was eventually successful in making the eastern Georgian territories an integral part of the Safavid provinces. In 1619 he appointed the loyal Simon II (or Semayun Khan) as a puppet ruler of Kakheti, while placing a series of his own governors to rule of districts where the rebellious inhabitants were mostly located. By the end of 1616, Iranian rule had been fully restored over eastern Georgia, but the Georgian territories would continue resistant Safavid encroachments from 1624 until Abbas' death. The Safavids were traditionally allied with the Mughals in India against the Uzbeks, who coveted the province of Khorasan. The Mughal emperor Humayun had given Abbas' grandfather, Shah Tahmasp, the province of Kandahar as a reward for helping him back to his throne. In 1590, profiting from the confusion in Iran, Humayun's successor Akbar seized Kandahar. Abbas continued to maintain cordial relations with the Mughals, while always asking for the return of Kandahar. Finally, in 1620, a diplomatic incident in which the Iranian ambassador refused to bow down in front of the Emperor Jahangir led to war. India was embroiled in civil turmoil and Abbas found he only needed a lightning raid to take back the far easternmost town of Kandahar in 1622. After the conquest, he was very conciliatory to Jahangir, claiming he had only taken back what was rightly his and disavowing any further territorial ambitions. Jahangir was not appeased but he was unable to recapture the province. A childhood friend of Abbas named Ganj Ali Khan was then appointed as the governor of city, which he would govern until his death in 1624/5. During the 16th century the Portuguese had established bases in the Persian Gulf. In 1602, the Iranian army under the command of Imam-Quli Khan Undiladze managed to expel the Portuguese from Bahrain. In 1622, with the help of four English ships, Abbas retook Hormuz from the Portuguese. He replaced it as a trading centre with a new port, Bandar Abbas, nearby on the mainland, but it never became as successful. Abbas moved his capital from Qazvin to the more central city of Isfahan in 1598. Embellished by a magnificent series of new mosques, baths, colleges, and caravansarais, Isfahan became one of the most beautiful cities in the world. As Roger Savory writes, "Not since the development of Baghdad in the eighth century A.D. by the Caliph al-Mansur had there been such a comprehensive example of town-planning in the Islamic world, and the scope and layout of the city centre clearly reflect its status as the capital of an empire." Isfahan became the centre of Safavid architectural achievement, with the mosques Masjed-e Shah and the Masjed-e Sheykh Lotfollah and other monuments including the Ali Qapu, the Chehel Sotoun palace and the Naghsh-i Jahan Square. In making Isfahan the centre of Safavid Empire, Abbas utilized the Armenian people, whom he had forcibly relocated to Isfahan from their Armenian homelands. Once they were settled, he allowed them considerable freedom and encouraged them to continue in their silk trade. Silk was an integral part of the economy and considered to be the best form of hard currency available. The Armenians had already established trade networks that allowed Abbas to strengthen the Iran's economy. Abbas' painting studios (of the Isfahan school established under his patronage) created some of the finest art in modern Iranian history, by such illustrious painters as Reza Abbasi and Muhammad Qasim. Despite the ascetic roots of the Ṣafavid dynasty and the religious injunctions restricting the pleasures lawful to the faithful, the art of Abbas' time denoted a certain relaxation of the strictures. 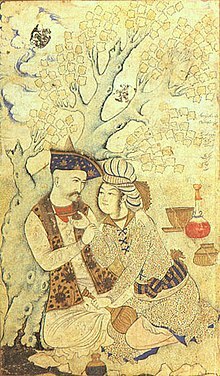 The portrait by Muhammad Qasim suggests that the Muslim prohibition against the consumption of wine, as well as that against male intimacy, "were more honoured in the breach than in the observance". Abbas brought in 300 Chinese potters to Iran to enhance local production of Chinese-style ceramics. Under Abbas' reign, carpet weaving increased its role as an important part of Persian industry and culture, as wealthy Europeans started importing Persian rugs. Silk production became a monopoly of the crown, and manuscripts, bookbinding, and ceramics were also important exports. Like all other Safavid monarchs, Abbas was a Shi'ite Muslim. He had a particular veneration for Imam Hussein. In 1601, he made a pilgrimage on foot from Isfahan to Mashhad, site of the shrine of Imam Reza, which he restored (it had been despoiled by the Uzbeks). Since Sunni Islam was the religion of Iran's main rival, the Ottoman Empire, Abbas often treated Sunnis living in western border provinces harshly. Abbas was generally tolerant of Christianity. The Italian traveller Pietro della Valle was astonished at the Shah's knowledge of Christian history and theology and establishing diplomatic links with European Christian states was a vital part of the shah's foreign policy. Christian Armenia was a key Safavid province bordering the Ottoman Empire. From 1604 Abbas implemented a "scorched earth" policy in the region to protect his north-western frontier against any invading Ottoman forces, a policy that involved the forced resettlement of up to 300,000 Armenians from their homelands. The Armenians came primarily from the wealthy Armenian merchant town of Jugha (also known as Jolfa). 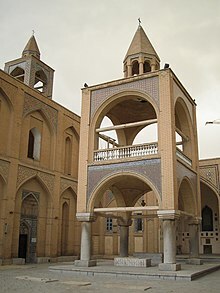 Many were transferred to New Julfa, a town the shah had built for the Armenians primarily meant for these Armenians from Jugha ("Old Julfa"), near his capital Isfahan. Thousands of Armenians died on the journey. Those who survived enjoyed considerable religious freedom in New Julfa, where the shah built them a new cathedral. Abbas' aim was to boost the Iranian economy by encouraging the Armenian merchants who had moved to New Julfa. As well as religious liberties, he also offered them interest-free loans and allowed the town to elect its own mayor (kalantar). Other Armenians were transferred to the provinces of Gilan and Mazandaran. These were less lucky. Abbas wanted to establish a second capital in Mazandaran, Farahabad, but the climate was unhealthy and malarial. Many settlers died and others gradually abandoned the city. Abbas' tolerance towards Christians was part of his policy of establishing diplomatic links with European powers to try to enlist their help in the fight against their common enemy, the Ottoman Empire. The idea of such an anti-Ottoman alliance was not a new one – over a century before, Uzun Hassan, then ruler of part of Iran, had asked the Venetians for military aid – but none of the Safavids had made diplomatic overtures to Europe and Abbas' attitude was in marked contrast to that of his grandfather, Tahmasp I, who had expelled the English traveller Anthony Jenkinson from his court on hearing he was a Christian. For his part, Abbas declared that he "preferred the dust from the shoe soles of the lowest Christian to the highest Ottoman personage". 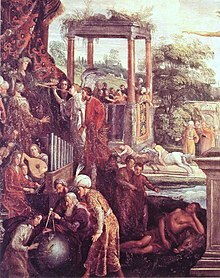 Abbas I as a new Caesar being honoured by the Trumpets of Fame, together with the 1609-1615 Persian embassy, in Allégorie de l'Occasion, by Frans II Francken, 1628. In 1599, Abbas sent his first diplomatic mission to Europe. The group crossed the Caspian Sea and spent the winter in Moscow, before proceeding through Norway, Germany (where it was received by Emperor Rudolf II) to Rome where Pope Clement VIII gave the travellers a long audience. They finally arrived at the court of Philip III of Spain in 1602. Although the expedition never managed to return to Iran, being shipwrecked on the journey around Africa, it marked an important new step in contacts between Iran and Europe and Europeans began to be fascinated by the Iranians and their culture – Shakespeare's 1601–02 Twelfth Night, for example, makes two references (at II.5 and III.4) to 'the Sophy', then the English term for the Shahs of Iran. Persian fashions—such as shoes with heels, for men—were enthusiastically adopted by European aristocrats. Henceforward, the number of diplomatic missions to and fro greatly increased. The shah had set great store on an alliance with Spain, the chief opponent of the Ottomans in Europe. Abbas offered trading rights and the chance to preach Christianity in Iran in return for help against the Ottomans. 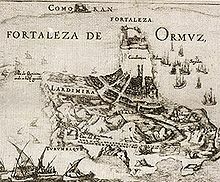 But the stumbling block of Hormuz remained, a port that had fallen into Spanish hands when the King of Spain inherited the throne of Portugal in 1580. The Spanish demanded Abbas break off relations with the English East India Company before they would consider relinquishing the town. Abbas was unable to comply. Eventually Abbas became frustrated with Spain, as he did with the Holy Roman Empire, which wanted him to make his 400,000+ Armenian subjects swear allegiance to the Pope but did not trouble to inform the shah when the Emperor Rudolf signed a peace treaty with the Ottomans. Contacts with the Pope, Poland and Muscovy were no more fruitful. More came of Abbas' contacts with the English, although England had little interest in fighting against the Ottomans. The Shirley brothers arrived in 1598 and helped reorganise the Iranian army, which proved to be pivotal for the Safavid victory in the Ottoman-Safavid War (1603-1618) and the first Safavid victory in battle over their neighbouring Ottoman archrivals. 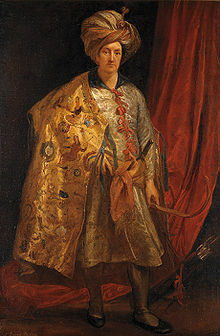 One of the Shirley brothers, Robert Shirley, led Abbas' second diplomatic mission to Europe between 1609-1615. The English East India Company also began to take an interest in Iran and in 1622 four of its ships helped Abbas retake Hormuz from the Portuguese. It was the beginning of the East India Company's long-running interest in Iran. Shah Abbas in later life with a page. By Muhammad Qasim (1627). Of Abbas' five sons, three had survived past childhood, so the Safavid succession seemed secure. He was on good terms with the crown prince, Mohammed Baqir Mirza (born 1587; better known in the West as Safi Mirza). 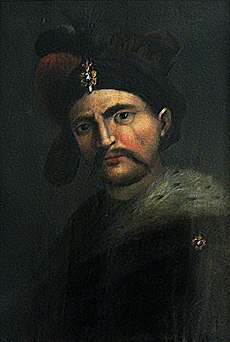 In 1614, however, during a campaign in Georgia, the shah heard rumours that the prince was conspiring against him with a leading Circassian, Farhad Beg Cherkes. Shortly after, Mohammed Baqir broke protocol during a hunt by killing a boar before the shah had a chance to put his spear in the animal. This seemed to confirm Abbas' suspicions and he sunk into melancholy; he no longer trusted any of his three sons. In 1615, he decided he had no choice but to have Mohammed killed. A Circassian named Behbud Beg executed the Shah's orders and the prince was murdered in a hammam in the city of Resht. The shah almost immediately regretted his action and was plunged into grief. In 1621, Abbas fell seriously ill. His heir, Mohammed Khodabanda, thought he was on his deathbed and began to celebrate his accession to the throne with his Qizilbash supporters. But the shah recovered and punished his son by blinding him, which would disqualify him from ever taking the throne. The blinding was only partially successful and the prince's followers planned to smuggle him out of the country to safety with the Mughals whose aid they would use to overthrow Abbas and install Mohammed on the throne. But the plot was betrayed, the prince's followers were executed and the prince himself imprisoned in the fortress of Alamut where he would later be murdered by Abbas' successor, Shah Safi. Imam Qoli Mirza, the third and last son, then became the crown prince. Abbas groomed him carefully for the throne but, for some reason, in 1627, he had him partially blinded and imprisoned in Alamut. Unexpectedly, Abbas now chose as heir the son of Mohammed Baqir Mirza, Sam Mirza, a cruel and introverted character who was said to loathe his grandfather because of his father's murder. Nevertheless, he did succeed Shah Abbas at the age of 17 in 1629, taking the name Shah Safi. Abbas's health was poor from 1621 onwards. He died at his palace in Farahabad on the Caspian coast in 1629 and was buried in Kashan. Tomb, the Mausoleum of Shah Abbas I. According to Roger Savory: "Shah Abbas I possessed in abundance qualities which entitle him to be styled 'the Great'. He was a brilliant strategist and tactician whose chief characteristic was prudence. He preferred to obtain his ends by diplomacy rather than war, and showed immense patience in pursuing his objectives." In Michael Axworthy's view, Abbas "was a talented administrator and military leader, and a ruthless autocrat. His reign was the outstanding creative period of the Safavid era. But the civil wars and troubles of his childhood (when many of his relatives were murdered) left him with a dark twist of suspicion and brutality at the centre of his personality." The Cambridge History of Iran rejects the view that the death of Abbas marked the beginning of the decline of the Safavid dynasty as Iran continued to prosper throughout the 17th century, but blames him for the poor statesmanship of the later Safavid shahs: "The elimination of royal princes, whether by blinding or immuring them in the harem, their exclusion from the affairs of state and from contact with the leading aristocracy of the empire and the generals, all the abuses of the princes' education, which were nothing new but which became the normal practice with Abbas at the court of Isfahan, effectively put a stop to the training of competent successors, that is to say, efficient princes prepared to meet the demands of ruling as kings." 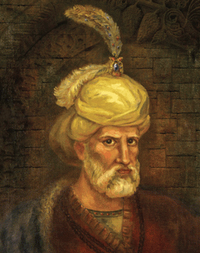 Abbas was fluent in the Turkish dialect used by the Turkoman portion of the multi-ethnic Qizilbash organization, although he was equally at ease speaking Persian, which was the language of the administration and culture, of the majority of the population, as well as of the court when Isfahan became the capital under his reign (1598). According to García de Silva Figueroa, the Spanish ambassador to the Safavid court during Abbas' later reign, he heard Abbas speak Georgian, which he had doubtlessly acquired from his Georgian gholams and concubines. Abbas gained strong support from the common people. Sources report him spending much of his time among them, personally visiting bazaars and other public places in Isfahan. Short in stature but physically strong until his health declined in his final years, Abbas could go for long periods without needing to sleep or eat and could ride great distances. At the age of 19 Abbas shaved off his beard, keeping only his moustache, thus setting a fashion in Iran. Prince Shahzadeh Sultan Mohammad Mirza (18 March 1591, Qazvin – killed August 1632, Alamut, Qazvin) Blinded on the orders of his father, 1621. Princess Gawhar Shad Begum, married to Mirza Qazi, the Shaykh-ul-Islam of Isfahan. Princess Malik Nissa Begum, married to Mir Jalal Shahristani, the mutvalli of the shrine of Imam Riza. ^ Ali Qoli Khan Shamlu, the governor of Herat, had originally been tasked with murder of Abbas by Shah Ishmail. Before he could act, the Shah had died, thus leaving him as governor, but without fulfilling his prerequisite task. ^ There is some confusion concerning the date which Abbas assumed power. The confusion sprouts from the fact that two distinctly different, but similar, occurrences both happened in the month of October, but in different years. First, Abbas seized power in the capital of Qazvin, whilst his father was leading the troops. This occurred on 16 October 1587. Then, after his father had returned, on 1 October 1588, Shah Mohammad abdicated and gave control of the empire over to Abbas in a ceremony. ^ a b Mikaberidze 2015, pp. 291, 536. ^ a b Blow 2009, p. 174. ^ R.M., Savory. "ALLĀHVERDĪ KHAN (1)". Encyclopaedia Iranica. Retrieved 1 January 2016. ^ Parizi 2000, pp. 284–285. ^ Babaie 2004, p. 94. ^ Blow 2009, p. 165. ^ Blow 2009, pp. 166, 118. ^ a b c d e f g Babayan, Kathryn (2002). Mystics, Monarchs, and Messiahs: Cultural Landscapes of Early Modern Iran. Harvard CMES. pp. 400–1. ISBN 978-0-932-88528-9. Asat'iani, Nodar; Bendianachvili, Alexandre (1997). Histoire de la Géorgie [History of Georgia] (in French). Paris, France: L'Harmattan. ISBN 2-7384-6186-7. LCCN 98159624. Axworthy, Michael (2007). Empire of the Mind: A History of Iran. London, UK: C. Hurst and Co. ISBN 1-8506-5871-4. LCCN 2008399438. Babaie, Sussan; et al. (2004). Slaves of the Shah: New Elites of Safavid Iran. Library of Middle East History. London, UK: I. B. Tauris. ISBN 978-1-8606-4721-5. Blow, David (2009). Shah Abbas: The Ruthless King Who Became an Iranian Legend. London, UK: I. B. Tauris. ISBN 978-1-84511-989-8. LCCN 2009464064. Bomati, Yves; Nahavandi, Houchang (1998). Shah Abbas, Empereur de Perse: 1587–1629 [Shah Abbas, Emperor of Persia: 1587-1629] (in French). Paris, France: Perrin. ISBN 2-2620-1131-1. LCCN 99161812. Bosworth, C. E. (1989). "Barda and Barda-Dāri v. Military Slavery in Islamic Iran". In Yarshater, Ehsan (ed.). Encyclopædia Iranica. III: Ātaš - Beyhaqi. London, UK: Routledge & Kegan Paul. pp. 774–776. ISBN 0-7100-9090-0. LCCN 84673402. Archived from the original on 24 May 2015. Retrieved 24 May 2015. Dale, Stephen Frederic (2010). The Muslim Empires of the Ottomans, Safavids, and Mughals. Cambridge, UK: Cambridge University Press. ISBN 978-0-521-69142-0. LCCN 2010278301. Eraly, Abraham (2003) . The Mughal Throne: The Saga of India's Great Emperors. original title Emperors of the Peacock Throne. London, UK: Weidenfeld & Nicolson. ISBN 1-8421-2723-3. LCCN 2005440260. Haneda, Masahi (1990). "Čarkas: ii. Under the Safavids". In Yarshater, Ehsan (ed.). Encyclopædia Iranica. IV: Bāyjū - Carpets. London, UK: Routledge & Kegan Paul. pp. 818–819. Archived from the original on 13 September 2014. Retrieved 13 September 2014. Hoiberg, Dale H., ed. (2010). "Abbas I (Persia)". Encyclopædia Britannica. I: A-Ak - Bayes (15th ed.). Chicago, IL: Encyclopædia Britannica, Inc. ISBN 978-1-59339-837-8. LCCN 2008934270. IBP (2013). Armenia Country Study Guide. 1: Strategic Information and Developments. International Business Publications. ISBN 978-1-4387-7382-7. Jackson, Peter; Lockhart, Lawrence, eds. (1986). The Cambridge History of Iran. 6: The Timurid and Safavid Periods. Cambridge, UK: Cambridge University Press. ISBN 0-5212-0094-6. LCCN 67012845. Kacharava, Eka (2011). "Alaverdy Eparchy" (PDF). Friends of Academic Research in Georgia. Archived (PDF) from the original on 24 May 2015. Retrieved 24 May 2015. Khanbaghi, Aptin (2006). The Fire, the Star and the Cross: Minority Religions in Medieval and Early Modern Iran. London, UK: I. B. Tauris. ISBN 1-8451-1056-0. LCCN 2006296797. Kouymjian, Dickran (2004). "1: Armenia From the Fall of the Cilician Kingdom (1375) to the Forced Emigration under Shah Abbas (1604)". In Hovannisian, Richard G. (ed.). The Armenian People from Ancient to Modern Times. II: Foreign Dominion to Statehood: The Fifteenth Century to the Twentieth Century. New York, NY: St. Martin's Press. ISBN 1-4039-6422-X. LCCN 2004273378. Lapidus, Ira Marvin (2012). A Global History of Pre-modern Islamic Societies. Cambridge, UK: Cambridge University Press. ISBN 978-0-5217-3298-7. LCCN 2011043732. Lockhart, Lawrence (1953). Arberry, Arthur John (ed.). The Legacy of Persia. The Legacy Series. Oxford, UK: Clarendon Press. LCCN 53002314. Madelung, W. (1988). "Baduspanids". In Yarshater, Ehsan (ed.). Encyclopædia Iranica. III: Ātaš - Bayhaqī. London, UK: Routledge & Kegan Paul. pp. 385–391. ISBN 0-7100-9121-4. LCCN 84673402. Archived from the original on 13 September 2014. Retrieved 13 September 2014. Manz, Beatrice; Haneda, Masashi (1990). "Čarkas". Encyclopædia Iranica. London, UK: Routledge & Kegan Paul. pp. 816–819. Archived from the original on 24 May 2015. Retrieved 24 May 2015. Matthee, Rudi (2011). Persia in Crisis: Safavid Decline and the Fall of Isfahan. International Library of Iranian Studies. London, UK: I. B. Tauris. ISBN 1-8451-1745-X. Matthee, Rudi (1999). "Farhād Khan Qaramānlū, Rokn-al-Saltana". In Yarshater, Ehsan (ed.). Encyclopædia Iranica. IX: Ethé - Fish. London, UK: Routledge & Kegan Paul. ISBN 0-7100-9090-0. LCCN 84673402. Archived from the original on 24 May 2015. Retrieved 24 May 2015. Matthee, Rudolph P. (1999a). The Politics of Trade in Safavid Iran: Silk for Silver, 1600-1730. Cambridge, UK: Cambridge University Press. ISBN 0-5216-4131-4. LCCN 99012830. Mitchell, Colin P., ed. (2011). New Perspectives on Safavid Iran: Empire and Society. Milton Park, UK: Routledge. ISBN 978-0-4157-7462-8. LCCN 2010032352. Mitchell, Colin P. (2009). The Practice of Politics in Safavid Iran: Power, Religion and Rhetoric. Persian Studies. London, UK: I. B. Tauris. ISBN 0-8577-1588-7. LCCN 2010292168. Mitchell, Colin P. (2009a). "Ṭahmāsp I". Encyclopædia Iranica. ISSN 2330-4804. Archived from the original on 24 May 2015. Retrieved 12 May 2015. Monshi, Eskandar Beg (1978). Tārīk̲-e ʻālamārā-ye ʻAbbāsī [The History of Shah 'Abbas the Great]. Persian Heritage (in Arabic and English). Translated by Savory, Roger M. Boulder, CO: Westview Press. ISBN 0-8915-8296-7. LCCN 78020663. Newman, Andrew J. (2006). Safavid Iran: Rebirth of a Persian Empire. Library of Middle East History. London, UK: I. B. Tauris. ISBN 1-86064-667-0. Parizi, Mohammad-Ebrahim Bastani (2000). "Ganj-ʿAlī Khan". In Yarshater, Ehsan (ed.). Encyclopædia Iranica. X: Fisheries - Gindaros. London, UK: Routledge & Kegan Paul. pp. 284–285. ISBN 0-7100-9090-0. LCCN 84673402. Archived from the original on 24 May 2015. Retrieved 24 May 2015. Quinn, Sholeh (2015). Shah Abbas: The King who Refashioned Iran. Oneworld Publications. ISBN 9781780745688. Roemer, H. R. (1986). "5: The Safavid Period". In Jackson, Peter; Lockhart, Lawrence (eds.). The Cambridge History of Iran. 6: The Timurid and Safavid Periods. Cambridge, UK: Cambridge University Press. ISBN 0-5212-0094-6. LCCN 67012845. Saslow, James M. (1999). "Asia and Islam: Ancient Cultures, Modern Conflicts". Pictures and Passions: A History of Homosexuality in the Visual Arts. New York, NY: Viking. ISBN 0-6708-5953-2. LCCN 99019960. Savory, Roger M. (1983). "'Abbās (I)". In Yarshater, Ehsan (ed.). Encyclopædia Iranica. I: Āb - Anāhid. London, UK: Routledge & Kegan Paul. pp. 71–75. ISBN 0-7100-9090-0. LCCN 84673402. Archived from the original on 24 May 2015. Retrieved 24 May 2015. Savory, Roger M. (1980). Iran under the Safavids. Cambridge, UK: Cambridge University Press. ISBN 0-521-22483-7. LCCN 78073817. Shakespeare, William (1863). Clark, William George; Wright, William Aldis (eds.). The Works of William Shakespeare. III. Cambridge, UK: Macmillan and Company. LCCN 20000243. Archived from the original on 24 May 2015. Retrieved 24 May 2015. Starkey, Paul (2010). "Tawfīq Yūsuf Awwād (1911–1989)". In Allen, Roger (ed.). Essays in Arabic Literary Biography. 3: 1850-1950. Wiesbaden, Germany: Otto Harrassowitz. ISBN 978-3-447-06141-4. ISSN 0938-9024. LCCN 2010359879. Sykes, Ella Constance (1910). Persia and its People. New York, NY: The Macmillan Company. LCCN 10001477. Thorne, John O., ed. (1984). "Abbas I". Chambers Biographical Dictionary. Edinburgh, UK: Chambers Harrap. ISBN 0-550-18022-2. LCCN 2010367095. Wallbank, Thomas Walter (1992) . Civilization Past & Present (7th ed.). New York, NY: HarperCollins. ISBN 0-6733-8867-0. LCCN 91025406. Wilson, Richard (March 2010). "When Golden Time Convents: Twelfth Night and Shakespeare's Eastern Promise". 6 (2). Routledge: 209–226. doi:10.1080/17450911003790331. ISSN 1745-0918. Pearce, Francis Barrow (1920). Zanzibar, the Island Metropolis of Eastern Africa. New York, NY: E. P. Dutton and Company. LCCN 20008651. Retrieved 13 September 2014. Wikisource has the text of a 1911 Encyclopædia Britannica article about Abbas I.
Wikimedia Commons has media related to Abbas I of Persia. John Wilson, Iranian treasures bound for Britain, BBC Radio 4, 19 January 2009, BBC Radio 4's live magazine, Front Row (audio report). Sam Mirza, later known by his first dynastic name of Safi II, and thereafter known by his more famous second dynastic name of Suleiman I, was the eighth Safavid shah (king) of Iran, ruling from 1 November 1666 to 29 July 1694. Shah Abbas II, was the seventh Safavid king (shah) of Iran, ruling from 1642 to 1666. Born Soltan Mohammad Mirza, he was the eldest son of Safi I with his Circassian wife, Anna Khanum. Farahabad was a palace and city built by Shah Abbas I in Mazandaran, Iran. It was built on a site formerly known as Tahan and linked to the town of Sari, 17 miles (27 km) away, by a stone causeway. The shah used the city as his winter capital, and he died there in 1629. Mirza Salman Jaberi Isfahani was a prominent Persian statesman in Safavid Iran, who served as the grand vizier of Ismail II and Mohammad Khodabanda.